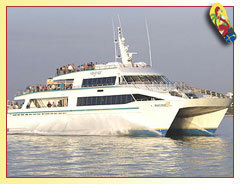 Transportation to and from Key West, Florida. 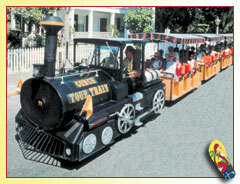 Key West is not a huge city and the Old Town area, where most visitors spend their time, is a large part of it, so it is quite easy to get around. Duval Street, often called the longest street in the world (because it starts at the Atlantic Ocean and ends at the Gulf of Mexico) is only about a mile long. A walking tour of Old Town is a very pleasant and interesting thing to do, so people who like walking will not be displeased. Unless you plan to stay in the newer areas of town, where the hotels and stores have their own parking lots, keeping a car in Key West may be more of a hindrance than a help. Many hotels and guesthouses in the Old Town area do not have off street parking so, when you make your reservations, ask about it. Metered spaces are available downtown for $1 an hour. At 300 Grinnell Street you will find a Park and Ride garage. 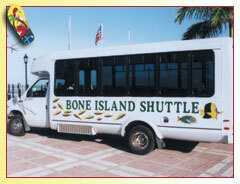 Parking is relatively inexpensive and you can ride a regularly operating shuttle to your destination. In addition, there are several privately owned parking lots all around the area, and the cost varies. Key West also has several unmetered parking spaces outside the main commercial area. But be aware that about half of the spaces are marked “residential parking” and if your car doesn’t have Monroe County plates or a residential sticker issued by the City, you will be ticketed there. Taxi service is available citywide and Charter Limo service is also easy to obtain. 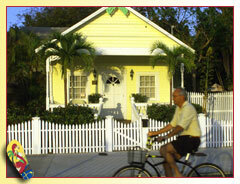 About 15% of Key West’s natives use bicycles to get around town. The island is pretty small and doesn’t have any hills. Some guesthouses and hotels provide bike rentals to their guests and rental shops are plentiful. Bicycle paths are becoming more prevalent, and where they are not available, you are permitted to use the sidewalk. But, remember, pedestrians always have the right of way and riders need to follow all traffic laws as if they were driving a car. You will be ticketed for running a red light or stop sign, or for riding at night without a light on your bike. And, of course, where there is an island, there are mopeds and scooters, and Key West is no exception. Many times you will be able to rent them from the same shops that rent bicycles. But, please be careful. Ambulances respond to around 300 moped accidents each year and tourists are involved in about three-quarters of them; many of which are alcohol related. Most of the accidents are not serious, but some involve concussions, skull fractures, and brain hemorrhages. You must be at least eighteen years old and a licensed driver with a credit card in order to rent a moped or scooter. Helmets are available upon request.